2006 ~ I Can Do That! Mix ingredients and marinate beef overnight in fridge. Drain meat, reserving the marinade. Lay on a large platter, place one set of filling on one long end, roll up, place another set of filling up to just halfway of the meat, roll up completely. Tie with kitchen twine all over, crosswise and lengthwise. Place in a large pan, add the reserved marinade and all the sauce ingredients, simmer in medium low heat for 2 hours. Fish out the rolls and let rest. Remove the bay leaves, adjust seasoning, then puree with an immersion blender or let cool a bit and transfer to a blender, blend in batches. Spoon sauce on a serving platter. Remove twine, slice morcon, arrange on top of sauce. Serve hot with lots of sauce. Mix all ingredients and chill overnight before serving. The macaroni salad is cooling in the fridge and the morcon is already stewing. Oh, yeah, I remember now why I never make morcon: it is so tedious to prepare. It took me almost an hour tying the rolls and maybe used up a hundred yards of kitchen twine! I made the yema balls last night and baked the meringue for the silvanas. I still have to prepare the buttercream though and I'm not sure if I still have the energy. In a small saucepan, mix milk and egg yolks. Cook over medium-low heat to a paste, stirring constantly. Form into 1 inch balls. In a heavy stainless steel pan, caramelize half the sugar. Moving quickly, dip the balls with toothpicks. Remove the candies by gently twisting the toothpick then pull out. Set the candies on a piece of aluminum foil to cool. If the caramel turns too brown throw it out. Clean the pan, caramelize another ¼ cup of sugar and dip the remaining balls. You can also roll the yema balls on white sugar, if preferred. 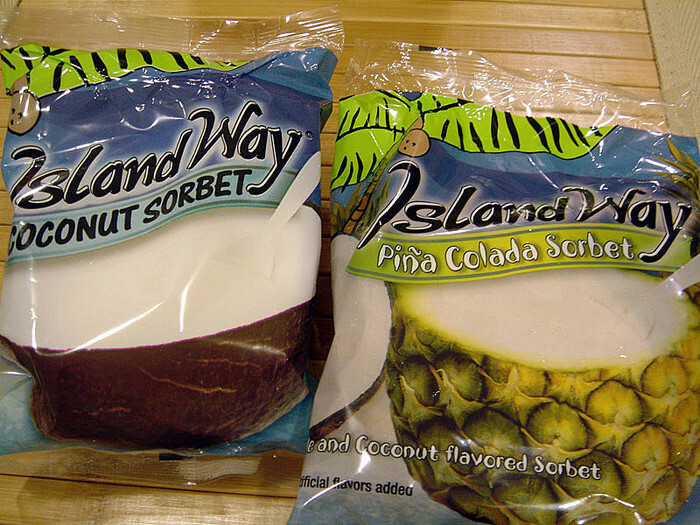 Wrap in colored or white cellophane. I don't use non-stick pan to caramelize sugar to be able to see the color progress of the caramel properly. Once the caramel gets too dark, throw it out and heat up another batch, ½ cup at a time. I'm not sure why the Thais call this dish son-in-law eggs. hmm. This is one of the simplest but tasty egg dishes to make, the ingredients are few and preparation is so easy. With very fresh tip yuchoy you can have a meatless dinner that's healthy and satisfying. Boil eggs for 8 minutes, cool immediately in cold water. Peel them then cut in half, you can leave the eggs whole but you will need more oil. Cover a big frying pan with 1/3 inch oil, fry the eggs cut side down until brown or slightly blistered but do not overcook. Arrange on a serving dish fried side up. Remove all the oil and throw in the shallot flakes, fry for a second, then remove them. On low heat stir brown sugar, nam pla and vinegar, bring to a boil then pour over the eggs. Sprinkle fried onions evenly on top. Garnish with chopped chilis and serve with steamed rice. *I fried only the egg yolk side and did not wait until they are golden brown in color as eggs become rubbery when overcooked. I think frying the eggs whole until golden brown will make the dish more visually appealing. I have been thinking of making round shaped food for New Year's Eve. I grew up with this tradition of eating 12 round food on New Year's Eve, usually 12 grapes, you can't really eat, say 12 apples (or watermelons?) or 12 putos in one sitting. It has something to do do with money (coin), which means the New Year will bring you luck, financially, the next 12 months. This old wives' tale/superstition most probably came from the Chinese, or maybe from the Kastilas (Filipino term for the Spanish-Filipino) or a combination, I don't know. I remember as a child every January 1st I was forced to wear a polka dot dress, silly, I know, but what can you do when you're a child, you have to do what your parents tell you. You can't have a tantrum or you'll be crying the next 365.242199 days. I will post the finished snacks and sweets on different days as I finish making them. I just finished reading my last book for this year, the excellent MEASURING THE WORLD by Daniel Kehlmann, translated from German by Carol Brown Janeway. Boiled mung beans with garlic chunks, sliced onions, a bay leaf, some sea salt and lots of Spanish extra virgin olive oil is the perfect vegetable soup to serve with the flavorful hens. I don't saute the garlic and onions, I just boil them together and there are no added flavorings. This seems out of the ordinary. The queen of angsty music and perpetually dour Aimee Mann singing Christmas songs! I can't wait to hear them, one song was co-written by her husband Michael Penn and Jon Brion, woohoo. I am loving David Lebovitz' cookbook RIPE FOR DESSERT. His quince marmalade looks so good with Spanish Manchego cheese, one of my favorites which I always use for apple and fig grilled cheese sandwich. You will need 3 quinces and half a lemon. To make: Place in a medium sauce pan 3 cups sugar and 4 cups water, bring to a boil. Quarter, peel and core the quinces then coarsely grate using a metal grater. Add the lemon half and the grated quince to the boiling syrup. Slow cook on medium heat until thick and reddish in color, about 30 minutes or when candy thermometer reads 220. Remove the lemon half and spoon into clear jar. Enjoy. My daughter has been nagging me to make this soup that I borrowed from my favorite food blog. The soup is really delicious, an excellent alternative to potato or corn chowder. The 2 strips of bacon is just the right amount of flavoring. Perfect with grilled (aged gouda) cheese sandwich. Costco always has something new in their warehouse that will surely make you buy (and become obese if it's food). I went this afternoon for more persimmons (there was none) and saw a table offering low fat, low sugar sorbet. 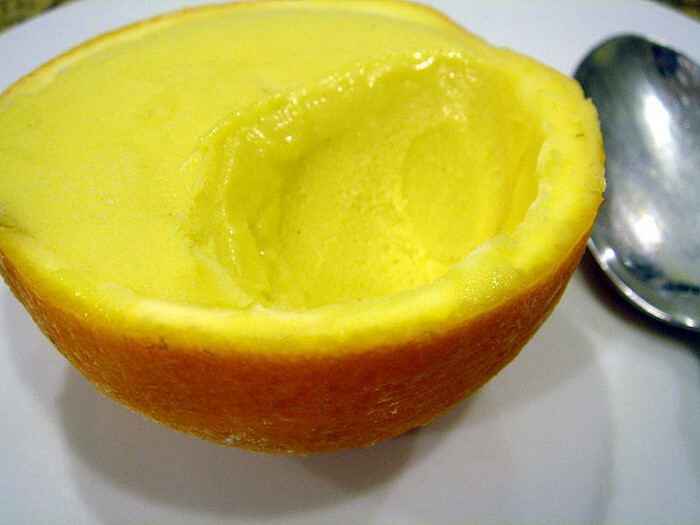 After tasting the really really good ice dessert I noticed the single serving (about less than a C) containers: a very tiny real pineapple shell, a real coconut shell, hollowed out half orange and lemon rinds. The box contains 2 of each flavor : orange mango, lemon, coconut and piña colada. My freezer is full but I just can't resist them, nobody can, I think. As I was leaving the table a large group of women were already oohing and aahing. Costco is the devil! 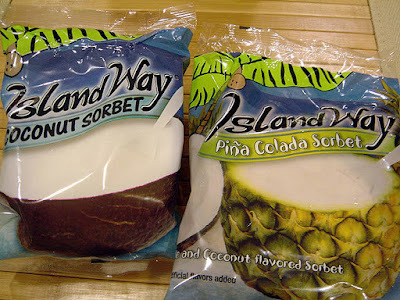 I already had the orange mango....hmm tomorrow, the coconut, can't wait. Note on the title: the weather is not so wintry nor Christmas-y the last week or so, specially today, high was 61° F in Ashburn, as high as 72° F in DC, that's hot! I hope it gets colder by Christmas. Today is my daughter's office Christmas party, she asked me 2 weeks ago to bake a dozen each of both the vanilla and red velvet cupcakes. Baking 2 half batches of different flavors is time consuming, I kid you not. It took me the whole day including frosting them and putting them on the carrying trays (and I don't get paid for my efforts). Hmm, I should be selling these cupcakes next time. I was worrying that they would get squished or damaged during transport, but then I saw this 3 piece gadget: baking pan, tray, and a cover that has a handle to carry both pan and tray and they all lock in place, very nifty idea. You can easily bring 2 dozens iced cupcakes with ease, without them touching and moving around. I love the person who invented this. I see a lot of different colored cauliflowers, purple, lime green and orange in many groceries lately. The label on this orange one says it has added nutrients and because I buy produce that looks pretty for posing, this one is a winner. I looked online for a good recipe and found this. I used the juice of one key lime in place of lemon. This dish is delicious! I really really like it. I never imagined combining anchovies with the bland and awful smelling cauliflower but the different flavors blend well perfectly. I just discovered these wonderful fruits Fuyu persimmons that I have been reading about and ignoring. I saw them in Bangkok 20 years ago and was told by the hawker not to bother with them, that they are very expensive and don't taste great. He said only the Japanese tourists love them, and I believed him. How can a fruit that looks like a very pale tomato taste good. That's my reason for not trying them for that long. Over a week ago I bought 3 pieces to photograph. One Korean lady told me to leave them on the counter for 5 days to ripen and to eat them when they are very soft but not mushy. Well, the Thai guy was wrong, they are very good when fully ripe and I love them, they're very sweet and the middle section near the seeds (2 or none at all) has the consistency similar to the Philippine caimito or star apple. The fruit is not bland at all, it has a unique taste I guess. I bought a box of 10 pieces today and will wait at least 3 days to enjoy them. I also bought fresh key limes, which is dayap in the Philippines, and kumquats. I also have been ignoring kumquats because I don't know how to use them in cooking. But they look so pretty, I bought a small quantity to take photographs for my flickr site. The salesperson told me to roll them in my hands until they are soft and they somehow become sweeter and she is absolutely right. You eat the whole fruit skin and all, except the seeds, it's sweet and tart, I also love them and they are so photogenic, too. They can also be candied whole or sliced. I prefer to eat them fresh. The recipes in this cookbook are not so extraordinary. I think many of the recipes can be found in other American cakes and cookie cookbooks like Better Homes & Garden recipe collections. But I am very satisfied with the red velvet 3 layer cake recipe which I halved and made into cupcakes for my daughter to try if they are good enough to take to her office Christmas party. The recipe is not as simple as the vanilla cupcake recipe and requires a lot of cleaning up afterwards. But then you are rewarded with these very very red, soft and moist delicious cakes. I didn't make the Creamy Vanilla Frosting that's supposed to ice these cakes because I wanted to try this real buttercream icing with powdered egg whites, butter and sugar. This is the best buttercream icing ever, not so sweet, it is very creamy and just perfect. I ate 2 of these sweeties after posing them, I can't help it, they're so yummy. Grease and lightly flour three 9 x 2-inch cake pans, then line the bottoms with parchment paper. In a small bowl, sift the cake flour and set aside. In a large bowl, on medium speed of an electric mixer, cream the butter and sugar until very light and fluffy, about 5 minutes. Add the eggs, one at a time, beating well after each addition. In a small bowl whisk together the red food coloring, cocoa and vanilla. Add to the batter and beat well. In a measuring cup, stir the salt into the buttermilk. Add to the batter in three parts, alternating with the flour. With each addition, beat until the ingredients are incorporated, but do not over beat. Divide the batter among the prepared pans. Bake for 30 - 40 minutes, or until cake tester inserted in the center of the cake comes out clean. Let the layers cool in the pans for 1 hour. Remove from the pans and cool completely on a wire rack. When the cake has cooled, spread the frosting between the layers, then ice the top and side of the cake with Creamy Vanilla Frosting. This silky smooth frosting is made by beating together softened butter and sugar with a thick saucelike base. Be sure to follow the recipe directions exactly. In a large bowl, on medium high speed of an electric mixer, beat the butter for 3 minutes, until smooth and creamy. Gradually add the sugar, beating continuously for 3 minutes until fluffy. Add the vanilla and beat well. Add the cooled milk mixture, and continue to beat on medium high speed for 5 minutes, until very smooth and noticeably whiter in color. Cover and refrigerate for 15 minutes (no less and no longer - set a timer!). Use immediately. Hot and spicy chili with beans is the perfect dish when it's cold outside. My stick-on thermometer at 1 PM today registered a low 28°F and with a slight wind chill it feels like 25°F. It is cold!! And I was thinking of putting the Christmas lights on my front bushes later today. I guess I have to wear a thick jacket and eat lots of chili before going out. Soak the beans overnight, simmer until tender, drain, reserving 1 cup of the cooking liquid. In a large pot, heat 1 tablespoon olive oil and saute garlic and onion for 2 minutes, add sausages and saute until sausages are cooked and slightly browned. Add all the spices, cook for 2 minutes, then add all the remaining ingredients except cheese and saltines. Simmer for 1 hour. Adjust seasoning. Serve with grated cheese and saltines. None of the fiction books I read this year made it to this year's The Washington Post Book World top 5, one non-fiction did, THE OMNIVORE'S DILEMMA: A NATURAL HISTORY OF FOUR MEALS by Michael Pollan. I am baffled that THE ACCIDENTAL by Ali Smith is among the list of 100. I think this novel is incredibly awful and one of the worst books in my honest opinion. Choucroute garnie for dinner tonight. Just a fancy French name for sauerkraut and meat, this recipe is from my old reliable Betty Crocker cookbook. I make this dish when I only have an hour to cook dinner, it is very easy and simple to prepare and so delicious. Make sure you have plenty of hard rolls to soak up the sauce. 6 peppercorns, 2 whole cloves, 1 bay leaf, 1 tablespoon coarsely chopped parsley - put in a piece of cheesecloth and tie with string. In a large pot, fry bacon until brown. Remove all but 1 tablespoon of fat, add onions and saute until cooked, add sauerkraut and brown sugar. Add the spices and meat, put the potatoes and apples on top. Pour the chicken broth and simmer for 30 minutes. I baked ube (purple yam) pandesal (breakfast or dinner rolls) today, the recipe from the Filipino cookbook Memories of Philippine Kitchens. The bread is so soft and has a fine texture. The ube taste is faint, though, but I really like the nice light purple color. Add ½ cup of ube powder with every 3 cups of flour to your recipe for hot rolls or pandesal. I fried some thick bacon rashers and added them to baked beans, so good with the hot rolls. Everybody (maybe) is happy, thankful and full today except for baby Tommy. Happy Thanksgiving! As a child I didn't care much for chestnuts. When I was around 5 or 6 years old I was baffled by my mother's yearly love affair with castañas (Spanish for chestnuts) usually in December as Christmas approached. She used to sit quietly at the table nibbling on maybe a pound of them until they're all gone. She was the only person in my family at that time who loved roasted chestnuts. My father, my older sister and I never shared her enthusiasm for them, we all thought they tasted of boiled sweet potatoes, nothing special about them. Most probably all those years she was secretly ecstatic that she didn't have to share them with anyone. Once in a while over the years she would coax us to try them but we were not convinced, same with the 2 younger siblings that came after me. I only "discovered" how good they are when I was in my 20s, with a 3 year old child. The new neighbors who also had a small child once waved us over to her house to introduce themselves. They were on their front porch eating roasted chestnuts and offered some which I refused but the wife was insistent and even opened and skinned one for me and since then I was hooked. I was wondering why they didn't taste of sweet potato as I remembered from childhood!! Since then every December I looked for them at the grocery (Rustan's) and at the Greenhills Shopping Center to see if they're available, which was not often in the Philippines. The ones we used to get came from China which in my honest opinion is the best tasting and the sweetest chestnuts, maybe because they are small and the flavor perhaps is concentrated, I don't know. There were years when there weren't any chestnuts at all due to restrictions on imported goods. When I was working at the Asian Development Bank my boss used to give us a Christmas gift basket with chocolates, imported fruits and the most important and the ones I treasured the most were the Japanese chestnuts. They were a lot bigger than the Chinese variety but were not as sweet. But chestnuts are chestnuts, I'll take them wherever they came from. I had my first European chestnuts in Luzern (Lucerne), Switzerland in October 1987. My companions and I were walking for some sightseeing when we stepped on colossal chestnuts that have fallen from the trees along the sidewalk. One of the girls and I were shrieking with glee and started picking the nuts (I know, WE WERE NUTS! ), not thinking how and where in the hotel we were going to cook them. I was wearing a sweater that did not have pockets and my handbag had no room for the nuts so my friend put them all in the huge pockets of her jacket. Then as we turned the corner there was a vendor selling freshly roasted chestnuts. The two us felt really stupid and bought a pound each that we nibbled on as we walked to meet the other people in our group. She did not throw the nuts in her pockets, I think she brought them back to Manila. My friend, her name is Tess, is on the right clutching the brown paper bag, that's me in the middle with my own bag warming my underarm. The other girl whose name is also Tess thought we were really crazy. That same year in December I was in chestnuts heaven. We were invited to the office Christmas party in Hong Kong and on our last night there, I saw a hawker right ouside the MTR train station beckoning me with the smell of roasting chestnuts, I felt giddy, all these wonderful chestnuts right in front of me. I asked the hawker for the price which was HK$12, and I asked for 10 pounds. He got mad and shooed me away, all the while mumbling in Cantonese and I was confused. Did he not want to sell me 10 pounds? Did he only sell half pound at a time? And then it came to me, since he did not understand English he thought I was asking for a discount, so I pointed to the weighing scale, my finger went round 10 times and he understood, grinned from ear to ear and gave them to me for HK$10 per pound. In my opinion the Chinese have the best method of roasting chestnuts. They cook them in a very very large wok filled with small stones or pebbles that are oiled, they bury the chestnuts in the very hot stones, then mix them once in a while with a gigantic spatula and fish out the chestnuts with an equally gigantic sieve. I can't figure out why the inner thin skin does not stick to the nuts at all even when they have gotten cold. It's a pity in my excitement I did not take a photo of the hawker. So, I carried the big bag of hot chestnuts to our hotel room and hand carried them back to Manila. Yes, I am nuts for chestnuts! And the chestnuts gods were kind to me, the very next year we moved to Hong Kong and I had my roasted chestnuts for the next 4 Christmas seasons. The first marrons glacés I had were a gift to my father-in-law from some Japanese businessmen also in the 80s. The Japanese marrons glacés were heavenly and once again I fell in love with another kind of chestnuts, this time it's candied. I know they are really, really expensive and only bought them once but haven't tried the French ones. My homemade ones are good enough for me. Nowadays, I buy dried Chinese chestnuts whenever they are available at the Korean groceries. I use them with bread stuffing and with Chinese recipes. I also buy the packaged roasted and peeled, ready to eat, also from China, very cheap at .90¢ for a 100gm package and they are available all year round. I have been going frequently to Costco to see if they have Aplets & Cotlets which they usually have at this time of the year. 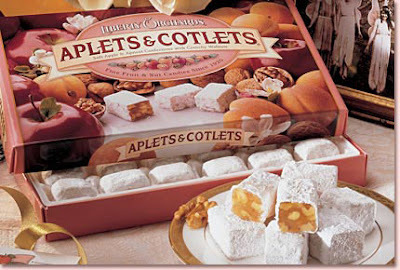 After 2 weeks it seems there won't be any so I ordered 1 box of Aplets & Cotlets and 1 box of Fruit Delights from their website. I don't understand why these candies are not available in stores. While waiting, I tried making my own using one of the recipes available online. 2 batches were palpak (disasters), the first was snotty in texture, yuck, and the second had a strong cornstarch feel on the tongue, blech. I might rethink the title of my post I can do that! because I can't do this. But searching online I found another recipe that sounds promising and will try making again tomorrow. Now that the costume is finished I have time to do other things. As for the Aplets I got a call from the seller that delivery will be delayed by at least 2 more days because of some shipping snafu, whatever. I want my Aplets & Cotlets now! I was going to make Pinakbet (vegetable medley) with Bagnet (fried pork belly) that I got from my cookbook Flavors of the Philippines by Glenda Barreto of Via Mare restaurants in Manila. I got this cookbook as a 2001 Christmas gift. It is a very beautiful, clear, direct and precise cookbook showcasing the best recipes of different regions in the Philippines. The photographs done by Japanese American Neal Oshima are fantastic. The vegetable medley is not the one I grew up eating, we have a different version in my hometown. After deep frying, the pork looked delicious I ended up chopping and serving half of it as Lechon Kawali (pork belly roast/fried in a wok) and reserved half for the pinakbet that I will make this week. This lechon kawali is eaten with either Mang Tomas sauce or vinegar, soy sauce and garlic dip, I had both. I also cooked these fine looking veggies snow pea shoots I spotted at the Korean grocery. They are very tender young leaves that I just washed thoroughly then steamed in a little water and 1/4 tsp salt until just wilted and still a little crisp. I like the simplicity of just adding a little calamansi juice or lemon juice to this side dish. 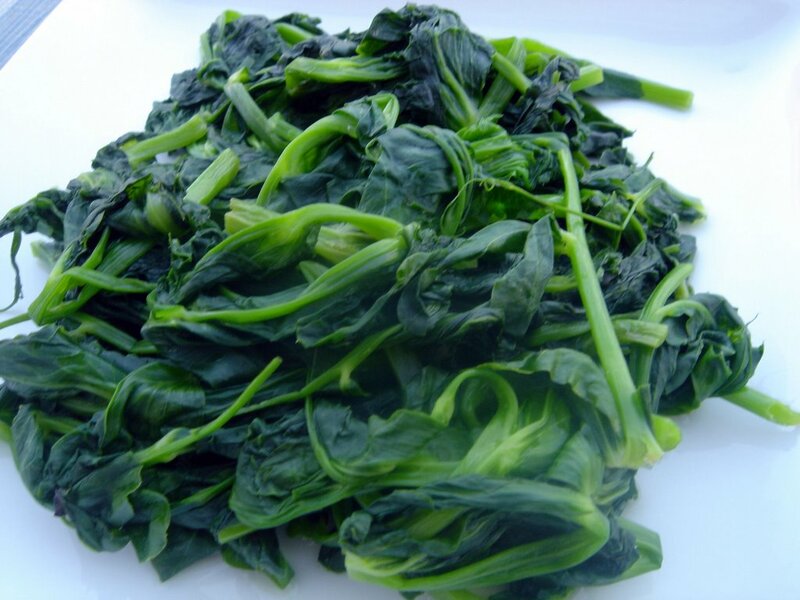 It does not need garlic, onion or some meat flavorings, I'm really loving it more than spinach or Swiss chard, this is the perfect veggies to serve with the fat laden pork.